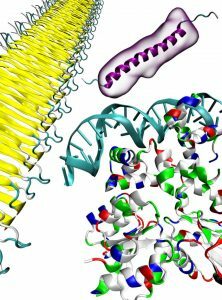 Researchers at Israel’s Technion have discovered a relation between the structure of α-helical strands in proteins and the formation of the toxic fibrils involved in neurodegenerative diseases, such as Parkinson’s, Alzheimer’s and Huntington’s diseases, and other systemic amyloidosis, including type 2 diabetes. The findings might one day lead to a development of drugs for the aforementioned diseases. HAIFA, ISRAEL (July 2, 2018) – Researchers in the Technion’s Wolfson Faculty of Chemical Engineering have discovered a relation between the structure of α-helical strands in proteins and the formation of amyloid fibrils – toxic fibrils involved in neurodegenerative diseases, such as Parkinson’s, Alzheimer’s and Huntington’s diseases, and other systemic amyloidosis, including type 2 diabetes. The findings, published in Biophysical Journal, could one day lead to a development of drugs for the aforementioned diseases. According to the researchers, helical coils of a certain structure are not stabilized by the environment, which increases the probability of amyloid formation. The DNA-binding protein illustrated on the right consists mainly of α-helical secondary structures. α-Helices are the most abundant structures found within proteins and play an important role in the determination of the global structure of proteins and their function. The yellow structure on the left is an example of amyloid fibril. Amyloid fibrils consist in most cases of β-sheets. The protein on top is the anti-microbial protein moricin. Surrounding molecules that are attached through bifurcated hydrogen bonds to the α-helical backbone function as a steric shield that reduces the probability of amyloid fibril formation. Proteins are biomolecular machines involved in a wide range of vital biological processes, including the transfer of oxygen from the lungs to the various organs and carbon dioxide in the opposite direction; extracting energy from molecules such as glucose; reception and conversion of acoustic and visual information into bioelectrical signals; and synthesis of DNA and other biopolymers. The proteins themselves are biopolymers made up of amino acid chains folded into three-dimensional structures that allow them to function. However, protein misfolding may impair function. A defect in protein folding may lead to various disruptions, including the formation of amyloid fibrils – very stable structures formed from misfolded polypeptide residues. These fibrils tend to accumulate in the brain in lumps, causing disorders such as Alzheimer’s, Parkinson’s, type 2 diabetes, Huntington’s, and Creutzfeldt-Jakob (“mad cow disease”). Their exceptional stability allows them to survive in particularly severe biological conditions. Due to the toxicity of amyloid fibrils and their potential damage, many researchers around the world are working to decipher the matter of amyloidogenicity – the conditions that cause the massive formation of amyloid fibrils. The study was led by Prof. Simcha Srebnik and doctoral student Boris Haimov. They studied the structure of α-helical regions in proteins that are involved in the formation of these fibrils. They developed novel equations that provide meaningful information on helical structures, and which were published in 2016 as an innovative analytical tool in the journal Scientific Reports. Existing helical domains were scanned and information was extracted using the equations. This information was cross-checked against existing information on amyloidogenic domains and a clear correlation was found between the helical structure and amyloidogenicity. In order to explain the relationship between the helical structure and amyloidogenicity, the researchers developed a physical model that assumes that structural changes are influenced by stabilizing forces in their environment. According to this model, the helical region forms bifurcated hydrogen bonds with the surrounding molecules (usually water molecules), creating a kind of protective sheath around the helical region. The model allows for the assessment of whether the helical region is protected and thus predict its amyloidogenicity. When the area is not protected, the formation of amyloid fibrils is more likely; when it is protected, such formation is not expected. Prof. Simcha Srebnik’s research group engages in the theoretical analysis and understanding of polymers and biopolymers. She and Boris Haimov conducted the present study through Technion’s Russell Berrie Nanotechnology Institute (RBNI). The researchers envision that the findings of their studies, which clarify the impact of environmental factors on helical structures with a tendency to form amyloid fibrils, will lead to the development of ways to prevent the formation of these fibrils. This work was funded in part by the Israel Science Foundation Grant No. 265/16. Boris Haimov acknowledges the generous financial support of the Irwin and Joan Jacobs Fellowship, and the generous financial support of The Miriam and Aaron Gutwirth Memorial Fellowship.